Untreated burlap bags are 10 oz. and are ideal for arid applications. Leaving them exposed to persistent moisture (ie, left in standing water) will accelerate their deterioration. If turned & allowed to dry, or deployed in a relatively sheltered placement, they can last for years. Treated burlap bags are 9 oz and treated with an EPA-approved ammonia solution that renders them resistant to rot, UV rays, insect & soil bacteria. They;re made in the USA and meet US military standard CID-A-A-52141, class A. Small orders limited to stock on hand; larger orders (one pallet or more) will require 5-7 business days prepaid. 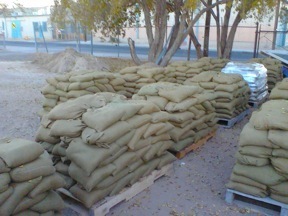 For both untreated and treated bags, we use 57-lb. test zipties for secure closure. Our standard fill material is masonry sand from recycled concrete. Filled dimensions: 16"L x 15"W x 3-4"H (approximate), weight average 30-35 lbs. each. One full pallet = 75 bags, one truckload (20 pallets) = 1,500 bags. 50 lb. bags available at no extra charge. One full pallet = 50 bags, one truckload (20 pallets) = 1000 bags. Bags can be filled to spec (plus/minus one pound) for engineering purposes. 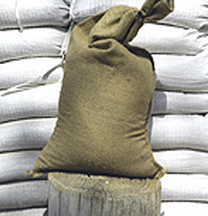 Filled treated burlap bags, 35 lb. - 1-74 count, 14"x26"